Should fossil fuels come with warnings? Should gas pump nozzles have labels on them? One of the best ways to remind people to turn out lights is to have a sticker on the switch that says, “Please turn off the lights.” It’s a key principle of social marketing: place a message where your target audience sees it at the precise time they can make the choice you’re requesting. It’s the same reason blunt messages and graphic images are placed on cigarette packages. Gasoline consumption generates emissions that are endangering our climate, so should there be warning messages on gas pump nozzles? 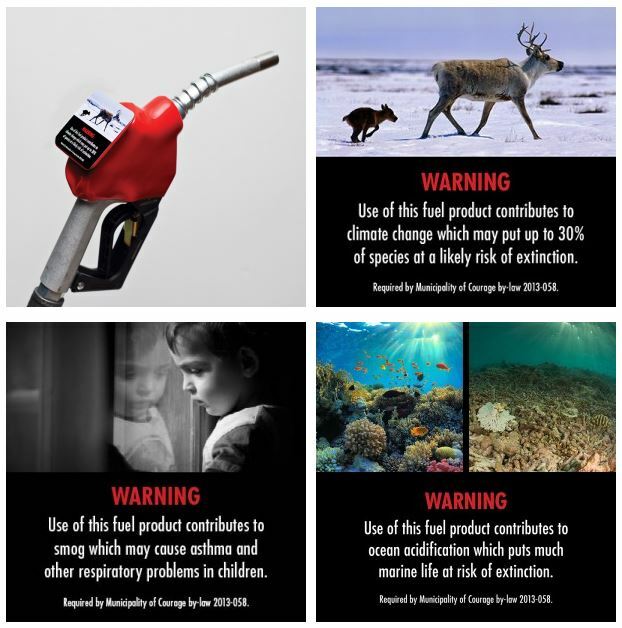 The municipality of West Vancouver thinks so, and has passed a resolution suggesting that labels like the ones shown here should be placed on every gas pump in Canada. Maybe it’s not a bad idea. Every litre of gas we consume adds 2.4 KG greenhouse gas emissions to our atmosphere. If a reminder when we’re fuelling up reminds us to try to burn less fuel, that would be a good thing. An interesting idea, and this week’s Green idea. More information here. Thanks to subscriber David Brown for the tip. If you have poor soil, limited space or a bad back, or just enjoy experimenting, consider straw bale gardening. Learn how here. You can find straw bales at your local garden center or farm supply store. Palm oil is contained in everything from margarine to chocolate to lipstick to biofuels. It’s now the world’s most popular vegetable oil. But palm oil has a dark side: deforestation. Particularly in tropical countries like Indonesia and Malaysia, massive areas of forest have been (and continue to be) cleared to make way for ever more palm oil plantations. So what can an eco-conscious consumer do? Check out this site to see how some of the planet’s most popular consumer brands rate when it comes to the palm oil; check out this video to learn more about palm oil issues and impacts.